The folks at Raven Software were kind enough to answer our questions concerning the up and coming Jedi Knight: Jedi Academy game. These questions were answered back on June 16th, but due to technical difficulties we're getting the response back just now. To sweeten the deal they've hooked us up with some exclusive screenshots! So without further ado...! 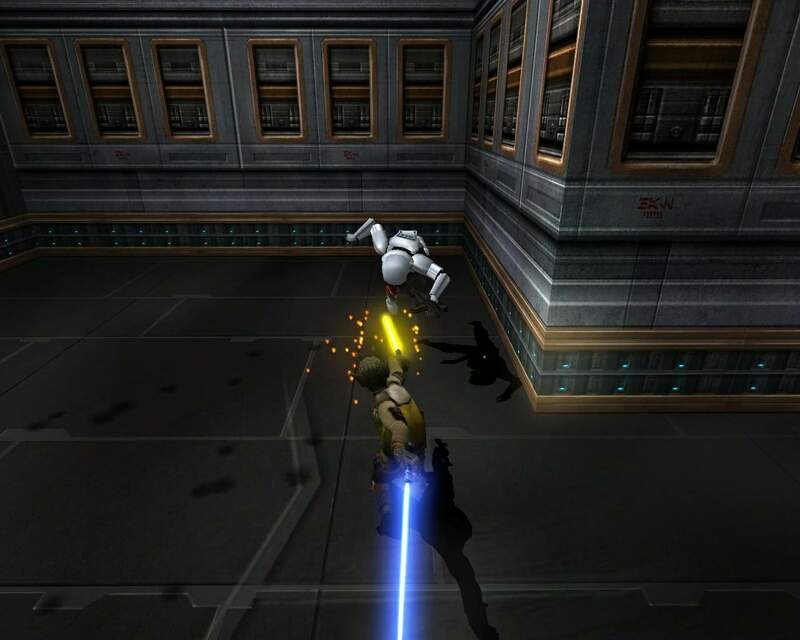 In Jedi Outcast, there were separate saber systems for single player and multiplayer. Can we expect the same in Star Wars Jedi Knight: Jedi Academy? All of the sabers, saber styles, fighting styles and acrobatic maneuvers available in the single player game will be available in multiplayer, but some will be tweaked for play balancing purposes. So in one sense, it�s the same system, but damage values and move durations may be slightly different. In Jedi Outcast, there were three saber stances for single saber usage. Will we see multiple stances (light, heavy, etc.) for dual sabers or the light staff? Will there be more than three stances for any of the saber styles? No, only the single saber has multiple stances. Dual sabers and the saber staff are their own stance. Will the special moves in Jedi Academy be executed by a series of small moves like in Jedi Outcast, or will they execute at the touch of a button? The special moves are executed similarly to those you�re used to, though there are many more moves to choose from. We have put a lot of work into making the control scheme as intuitive as possible. Will the interface include a kind of progress bar to indicate if you're leaning towards the light or dark side? Similar to the Jedi Knight: Dark Forces II "Scale of Morality". There is no light side/dark side status bar in Jedi Academy, but the path choice is part of the game. In the multiplayer game, will all Force powers be available to all players, or will there be a system in place where light-side players only have access to light-side powers and vice versa for dark-side players? It will be the same as in JKII, players will choose either light or dark powers. We're intrigued about the role-play aspect in character creation of the single player game. Will the single player characters we create carry on to the multiplayer part of the game? Will we be able to select NPCs and all of our favorite Star Wars characters from the single player game in multiplayer mode? You will be able to customize your character in multiplayer along with 40 or so other NPCs and recognizable Star Wars characters. We've read that you need to complete about 80% of the missions in order to complete the single player game. After beating the game, will we have the opportunity to go back to complete any missions we missed? No, you would have to start a new game. 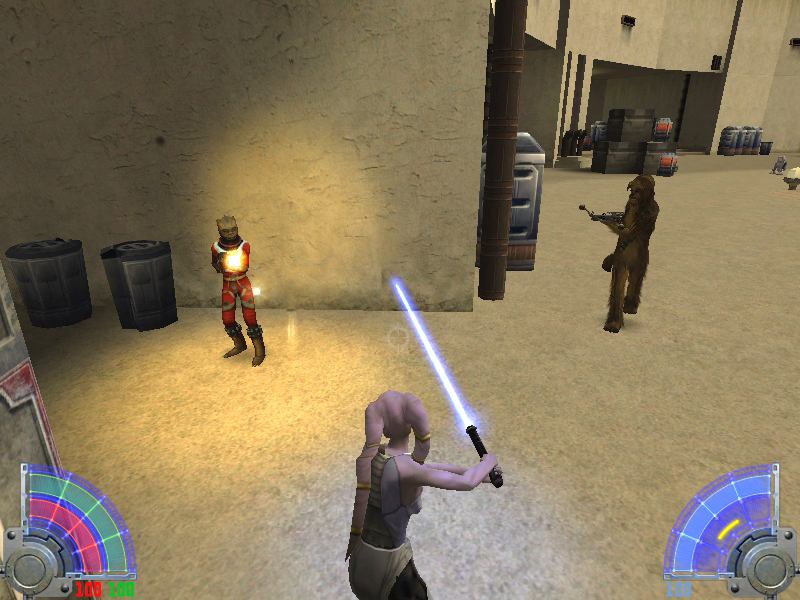 We�ve intentionally built a lot of replayability into Jedi Academy. There are so many Force Powers to choose from, that the player will not be able to max them out during a single playthrough, so they can go through the game again and pick different powers and have a completely different experience. Similarly, they can pick missions they may have missed, skip other ones, or just play them all. The addition of the lightstaff and new saber stances are very reminiscent of some of the mods released for Jedi Outcast (like JediMod, JediPlus, etc.). How much, if any, has the Jedi Outcast modding scene contributed to what will go into Jedi Academy? Will we expect to see any other Jedi Outcast mod influences in Jedi Academy? 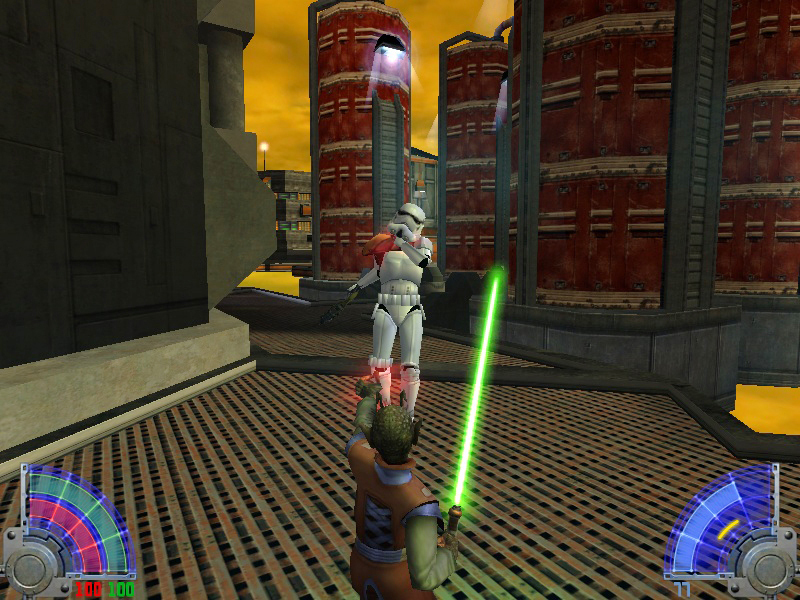 We were very happy to see what the mod community did with Jedi Outcast, but the mods were not an influential factor in Jedi Academy�s development. The team set out to accomplish a series of design goals, the most prominent of which was the enhancement of the saber combat, and the saber mechanics that emerged were just part of the logical progression of the design. The Raven team is made up of Star Wars fans, just like the mod community, so everyone is essentially drawing from the same source material. One of the main fissures in the Jedi Outcast community is between the "gamer" who's concerned with fragging and the "Star Wars fan" who's concerned with dueling, honor, and other Jedi-like concepts. How will Jedi Academy be able to satisfy both player types? The issue you mention is, unfortunately, more about individual player personalities than it is about the game itself since both factions found Jedi Outcast multiplayer to be fun, but only when playing with like-minded individuals. It�s really up to the players to find friends and servers online that adhere to the same gameplay principles they do. Big thanks to Ronda at Lucasarts, the folks at Raven Software, and Arcuss for arranging this interview for us. I can't wait for the game! Check out the new double blade moves! True wisdom is the knowledge that you know nothing. This is great. It's awesome that my suggested question got asked (I'm pretty sure I suggested it first), just a slight perk. "Will the special moves in Jedi Academy be executed by a series of small moves like in Jedi Outcast, or will they execute at the touch of a button?" Either way, great questions all around. It takes a great group like this to think of such questions. Good job! I'm excited about the traffic we'll be seeing! New people too! Jedi do not fight for peace. That's only a slogan, and is as misleading as slogans always are. Jedi fight for civilization, because only civilization creates peace. Personal sleepness-nights-supporter of Virtue. Owner of the 1000th comment of Daidalus and 1943th comment of Gradius! Owner of the 300th comment of Carda! yay JA for geting a JK:JA review!!!! I would have asked if dueling is going to be more like the movies, i.e. more defensive moves and cool block-counter combos instead of just moving back and forth trying to hit each other. I think the designers should have spent a few dozen hours playing the old arcade game Karate Champ and maybe Mortal Kombat when they coded dueling for JK2--I don't mean that dueling should be anything like those games, far from it, just that it should be more style-and-thinking than hack-and-slash. I'll be interested to see how JK3 turns out in that respect. Thanx arcuss!!! You da man!!! Now it's even tougher to wait for this to come out! But when it does......Wiggy wiggy w00t w00t!! Post your RL pics HERE! | Post you JK2/JK3 screenies HERE! In the navy and LOVING it! Recipient of comment no. 1000 and heart-warming words from Ataris! The real question is not whether machines think but whether men do. YAY and thanks arcuss very much you rock!!!! mmmm nice, I can think of loads more questions I wanna ask em though lol. Nvr mind. Brady Brothers: Orion-Greg, Furi0us-Peter, Me-Bobby. Long lost cousin to Flash. Midbie Council #007. Ex-JAK. This comment was edited by Jello` on Aug 02 2003 03:40pm. IM THE MOST HATED PERSON IN THE ACADEMy!!! !